There’s nothing like starting a luxurious weekend as one of only two passengers in business class. My flight to New Zealand on Air New Zealand is an exercise in pampering. I have the undivided attention of a friendly flight attendant who serves me champagne even though it is only 10am. Well, it’s noon in New Zealand and one needs to acclimatise right? Non-stop food all the way to Queenstown accompanied by a lovely NZ Pinot Gris. 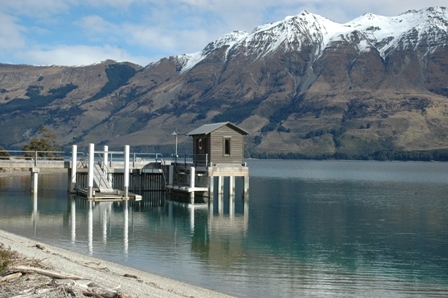 The road from Queenstown to Blanket Bay hugs the coast of Lake Wakatipu, flanked on either side by high snow-capped mountains. And this isn’t the scenic part of the country that New Zealand is famous for. That’s over the mountains to the left. Blanket Bay Lodge sits on the waterfront at the northern end of the lake about 40 minutes drive from Queenstown. A gravel driveway winds past chalets to a grand main building. My chalet has an open fire, floor to ceiling picture window overlooking the lake and surrounding mountains, goose down doona and Italian triple stitch sheets. The shower even doubles as a steam room. Dinner each night is a five course affair which starts with horsedouevres in the bar. The dinner menu here changes daily and includes such delights as lobster, venison, and rack of lamb, however if that’s not good enough you can, within reason, order whatever you like and the chef will endeavour to prepare it for you. No one leaves New Zealand complaining about having lost weight. After dinner I sink into my goose down bed and slip into a coma. I manage, even though I’m on Sydney time, to sleep through breakfast but I’m served eggs Benedict and fruit salad anyway as I prepare myself for the day’s activities. The jet boat arrives at the jetty to pick me up, I’m handed a packed lunch and we head off up river through Middle Earth. The scenery is truly breathtaking, and I know you’ve heard that before but, really, it is. And my photography (or use of adjectives for that matter) probably won’t do it justice. We jet up the Dart River in water in some places only 10 centimetres deep. This is a glacial river and it braids downhill in criss-crossing streams which we navigate at breakneck speeds. And what better way to end the day than with a 60 minute massage? An entirely relaxing Swedish massage, during which I think I may have snored a wee bit. My next day’s activity is a horse ride up one of the mountains surrounding our valley, at nearby Wyuna Station. The horses here are American quarterhorses, sturdy sure-footed work horses and my ride is Rio, a placid chestnut who knows the way. The view from the top is truly spectacular and the atmosphere incredibly peaceful. The only noise is from the breeze and the many bubbling creeks making their way down the mountain. The afternoon provides spectacular views from an alternative mode of transport: a helicopter. My ride picks me up from the front lawn and we go on a tour over the mountain ranges, in search of waterfalls and frozen lakes. The different scenery we pass within minutes is hard to comprehend. We fly through clouds and an alpine range of peaks and valleys before rounding the corner into Fiordland. Milford Sound is spectacular and it’s difficult to try and get a sense of scale, the mountains are so steep and high. We pass countless waterfalls before heading out to sea and along the coast to land on the pink volcanic sand of a nearby beach before heading back into the mountains to land on a frozen lake. My last day here is spent exploring Queenstown before a leisurely lunch at Amisfield Winery. It is recommended here to choose the “Trust the Chef” option. Available for two or more people, you will be served a four course meal at the chef’s discretion. The Amisfield Pinot Gris is a multi-award winner – and a lovely little drop it is too. Blanket Bay offers a luxury wellness retreat, dare I say, unlike any other. The solitude and restful atmosphere together with magnificent scenery and gourmet menu leave you truly refreshed, rejuvenated and indeed, spoiled.